Centralized air condition with laminar flow and hypo filter. A multi-parameter monitor is configured for real time monitoring of ECG, non- invasive blood pressure, invasive blood pressure, heart beat, pulse, respiration on a single screen. A centralized gas and suction. 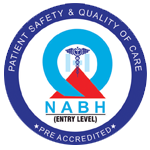 Well trained nurses and paramedical staffs at one to one basis.